W elcome to Hotel Vogue (Bungalows de los Arbolitos) in Sayulita Mexico. Come settle into your private suite in the heart of this quaint fishing village, across from El Centro, Sayulita’s picturesque town square. From your base here, anything you want…from organic food to surfing lessons…is just steps away. Here you can fall asleep to the sound of the ocean’s waves and awaken to birds’ songs. This small boutique lodging offers spacious one and two-bedroom suites, sleeping four comfortably, constructed by local artisans using primavera wood, stained glass windows, riverbed rocks and Mexican tiles. Each has a well-equipped kitchenette and is furnished with textiles and artifacts from towns throughout Mexico. 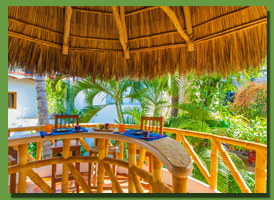 Private balconies are tucked among tall palms, lush vines and blooming bougainvilleas. Staircases lead to second story suites, where mornings feel like waking in a tropical tree house. All water from taps in the bungalows, including showers, is purified by reverse osmosis. Each suite has ceiling fans and air conditioning. Daily maid service and luxury linens, helps assure that you will feel pampered and well cared for. 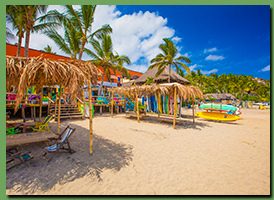 Hotel Vogue is located on a street that ends in Sayulita’s protected bay. From its front entrance, you may walk to dozens of restaurants and quaint shops. The wide, curving beach beckons to swim, surf or just sit with a good book and take in the peacefulness of this magical Mexican village. When you return in the evening, you’ll find the soft light of torches welcoming you and lighting the pathway, outside your bungalow. If traveling with family or friends, ask about adjoining suites. We are pet friendly! And while we hope you’ll let yourself feel truly away-from-it-all here, wireless Internet is available in each suite, so you may stay in touch with anyone.